This beautiful oil on canvas portrait is by Norwegian artist Hans Dahl of Hardanger in Norway. 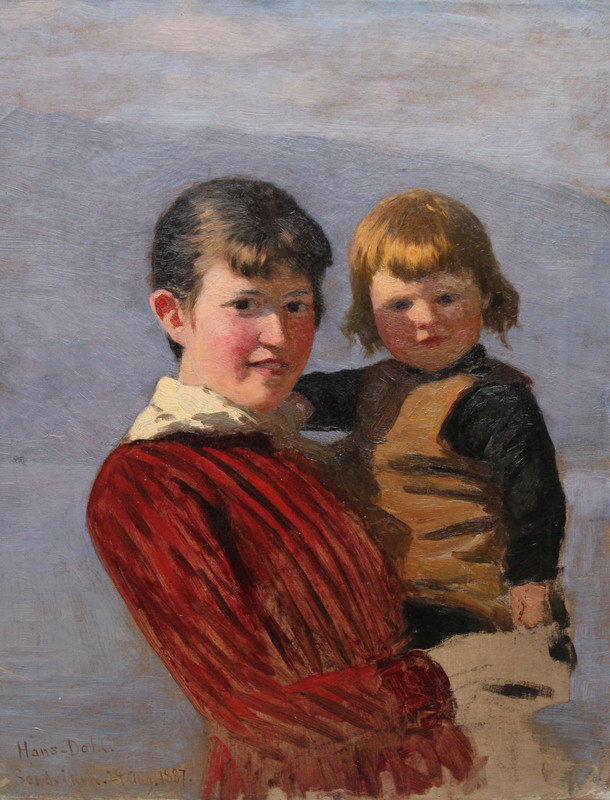 The work depicts an older sister in a stripped red dress with a child in her arms. The brush work is Norwegian Impressionist and free flowing. The picture looks to be a sketch, perhaps plein air, as the older girl's hands are unfinished. The work is signed and dated 24th August 1887 and also has the location as Sandviken, a neighbourhood of the city of Bergen in Norway, in a small bay off the Byfjorden. Housed in a fine frame approx 28 inches by 24 inches and in excellent condition.